Nato has pledged to counter "hybrid warfare" from Russia. The alliance said it must adapt to the mixture of conventional military tactics, subversive campaigns and cyber-warfare that Russia was using in Ukraine. Nato says that Russia is backing rebels in Ukraine - a claim denied by Moscow. "Hybrid warfare combines different types of threats, including conventional, subversion and cyber," said Nato chief Jens Stoltenberg. "When the world has changed, Nato has to adapt," he added. Speaking after a meeting of defence ministers in Turkey, Mr Stoltenberg said that a more assertive Russia had been using force to change borders and intimidate its neighbours. The two-day conference was also attended by EU foreign policy chief Federica Mogherini. Nato has said that it will look to increase its co-operation and intelligence sharing with the EU. "We will ensure that the strategies we are developing are complementary, so that we can work together quickly and effectively in the case of a hybrid threat against any of our members," said Mr Stoltenberg. In another development, Estonia, Latvia and Lithuania have said they are preparing to ask Nato to station one troop battalion in each country. Lithuanian Army spokesman Capt Mindaugas Neimontas said that the request would be made in a joint letter later this week. "It is necessary because of the security situation," he told The Associated Press news agency. "It's not getting better in our region, so it will be a deterrent." There is growing concern over increased military activity from Russia. On Thursday, RAF fighter jets were scrambled after two Russian military aircraft were seen flying towards UK airspace. Nato forces have also stepped up military exercises, especially in eastern European nations. 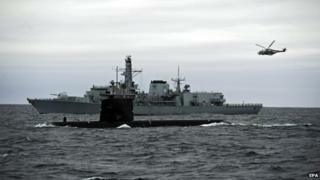 The alliance is conducting its largest ever anti-submarine warfare exercise in the North Sea, off the coast of Norway. The West has criticised Russia for annexing the Crimean peninsula and has accused Russia of arming rebels in the east of Ukraine. More than 6,000 people have been killed in fighting which began in April 2014 between Ukrainian government forces and rebels in the eastern Donetsk and Luhansk regions. The lull in the conflict in eastern Ukraine since February's ceasefire has been punctuated by frequent violations, and on Tuesday Ukraine said three of its soldiers had been killed in the past 24 hours.